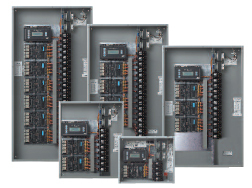 We can service and provide parts for your Intelligent Lighting Controls (ILC) LightMaster lighting control panels! The LightMaster programmable lighting control panel is suitable for all your lighting control needs. LightMaster panels range in size from 8 to 48 relays and are equipped with CAT-5 RJ-45 connectors for LightSync dat line devices and interconnecting panels. Panels include a keyboard/LCD display along with RS232, RS485, or an optional TCP/IP port to enable PC control and programming. Add-on modules are available if you require connecting to BAS, theatrical, or security systems. Made in the USA relays and hardware. Programming Options are done with a Integrated keypad with 4-line LCD display or using LightMaster Pro software via RS232 or optional TCP/IP. LightSync Data Line Device Ready utilizing RJ45 connectors and standard CAT-5 cabling for data line. Network capability gives you the ability to connect panels for up to 128 panels and 254 LightSync devices on the panel network. Relay Groups can be comprised of any relay on the network and be assigned to any of the 48 groups available controlled by any timer, switch, or other external commands. Relay Presets can be programmed from any relay ON/OFF patterns and be assigned to any of the 48 presets available controlled by any timer, switch, or other external commands. Timer Scheduling for 48 available timers that can turn relays ON or OFF for Time-of-Day, Astronomical times, and Open/Close. Clock Functions features Automatic Astronomical calculation of Sunrise and Sunset and Adjustable Daylight Savings Time and enable/disable feature. Switching Inputs accepts vitually any type of switch input, momentary or maintained, 2- or 3-wire hardwired switch. Add-On Modules can be added to each controller, which include BACnet, Modbus RTU, Modbus ASCII, Metasys N2, LonWorks, DMX512, DTMF telephone switching and modem. 2R9 latching relay: 120 - 277VAC @ 20 Amp for ballast and resistive loads 180,000A SCCR. 2-Pole latching contactors: 208-480 VAC, 20 Amps for ballast and resistive loads. Data line surge and spike suppression up to 8kv direct and 15kv through air (optional).